Cantonment Martin was the first military post in Kansas under the authority of the United States Government. The post was established on Isle au Vache, or Cow Island, in October 1818. Located on the island in the Missouri River within the bounds of the present-day Atchison County, Kansas, it was established by Captain Wyly Martin, with a detachment of the Third Rifle Regiment, as a base of supplies for Major Stephen H. Long’s Expedition of 1819-1820. Major Long and his explorers reached the site on August 18, 1819, on the Western Engineer, the first steamboat to go up the Missouri River. Before leaving Cow Island for his famous scientific journey into the Rocky Mountains, Major Long held a peace powwow with 13 Osage and 161 Kanza Indians. 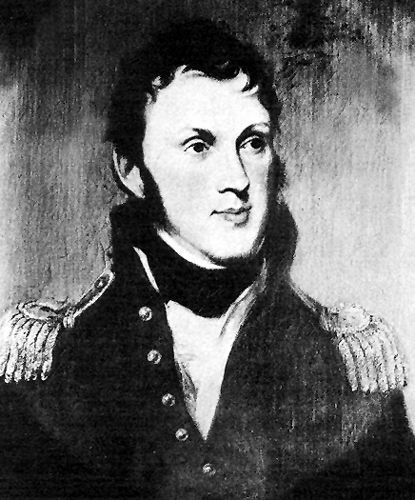 Captain Wyly Martin and his men stayed behind to build the post when Long and his explorers headed westward. The fort was erected of cottonwood logs and the regiment spent the winter of 1819 there. John O’Fallon was later a prominent citizen of St. Louis, Missouri was the post sutler. It was Captain Martin’s intention to vacate the cantonment early in the spring of 1819 and continue his march westward, but his supplies failed to arrive as expected, and he remained at the post until the main body of the expedition under Major Long returned in July. After the remainder of Long’s Expedition returned in October 1820, the camp was abandoned. In 1826, it was temporarily occupied by the First United States Infantry and renamed Camp Croghan. By 1832, no buildings remained on the island due to a number of floods of the Missouri River. The island was not occupied again until the Civil War. On June 3, 1861, members of the First Kansas Volunteers used it as a base of operations against the Confederate town of Iatan, Missouri which was on the opposite side of the Missouri River.